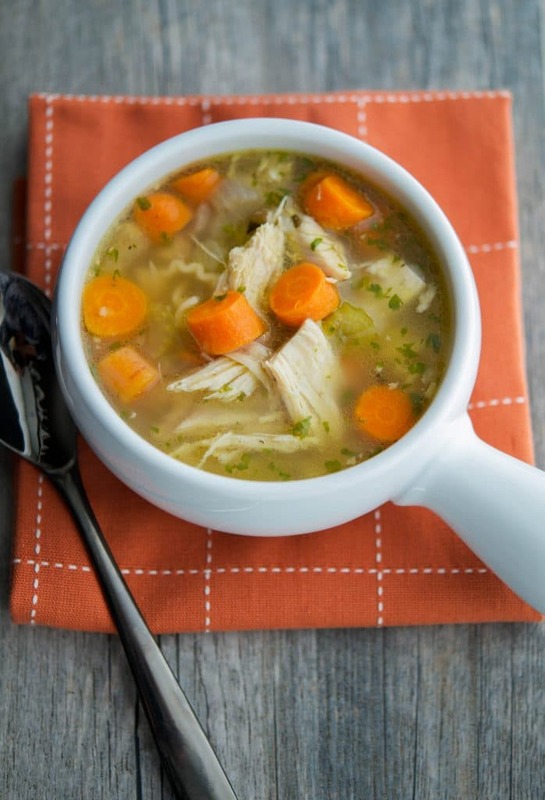 Learn how to make homemade Chicken Noodle Soup using the carcass of a whole roaster chicken. It’s simple to make & a staple during those cold winter months. Alright, I confess. 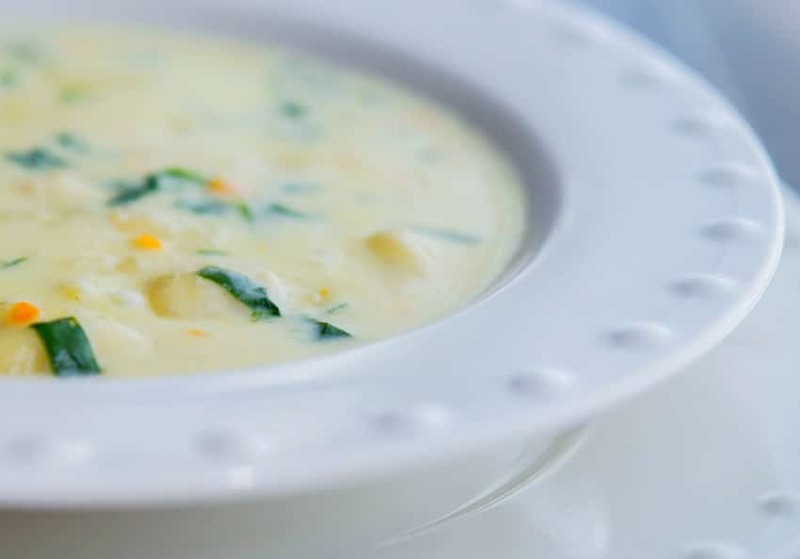 Technically this is a rerun of one of the first recipe posts I did back in 2011 for Chicken Ditalini Soup with a slight twist. 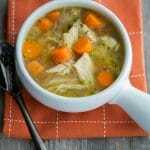 You see, when I initially made this soup for the blog, I just used a bone-in chicken breast to make the soup since it was a smaller amount. But then I got to thinking how I really make this soup most of the time and that is by using the entire carcass of a roasted chicken (or turkey). 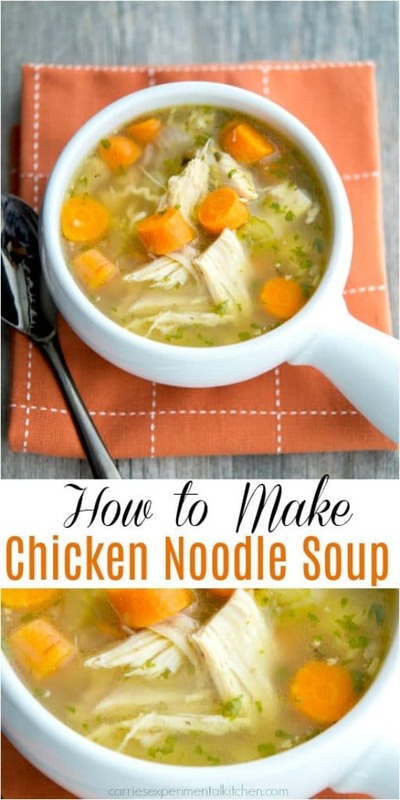 Now that my daughter is living on her own (and recently came down with her first cold), I thought I’d share this basic recipe on How to Make Chicken Noodle Soup at home. It’s quick and basically fool proof. You can add whatever vegetables, pasta and/or rice you prefer, but I go the simple route and just use celery, carrots, onions and whatever pasta I have an opened box of. Step 1. 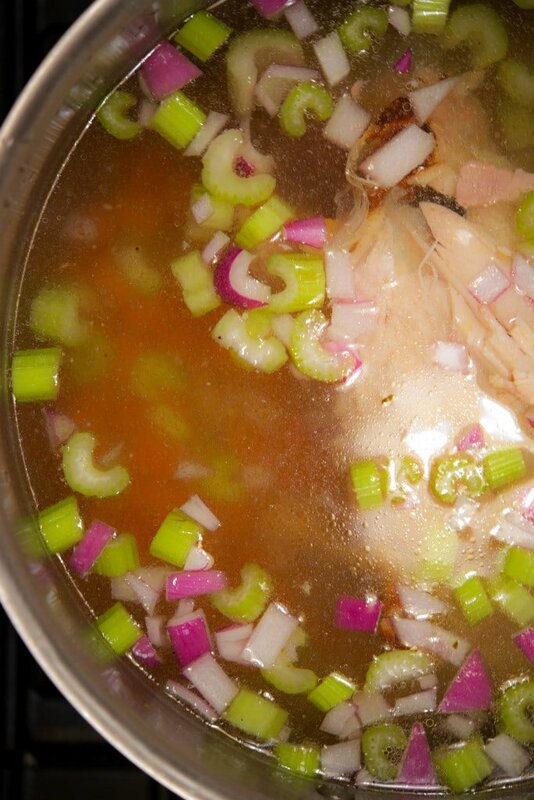 Add the chicken (or turkey) carcass to a large pot; then fill the pot with water covering the carcass. Step 2. Add your vegetables (I use chopped celery, carrots and onions), salt and pepper and bring to a boil over high heat. Cover the pot, reduce heat and allow to simmer for 1 hour; stirring occasionally. Step 4. Cut off any remaining pieces of meat from the carcass and add it to the pot, along with any extra meat you may have saved from the initial carving. 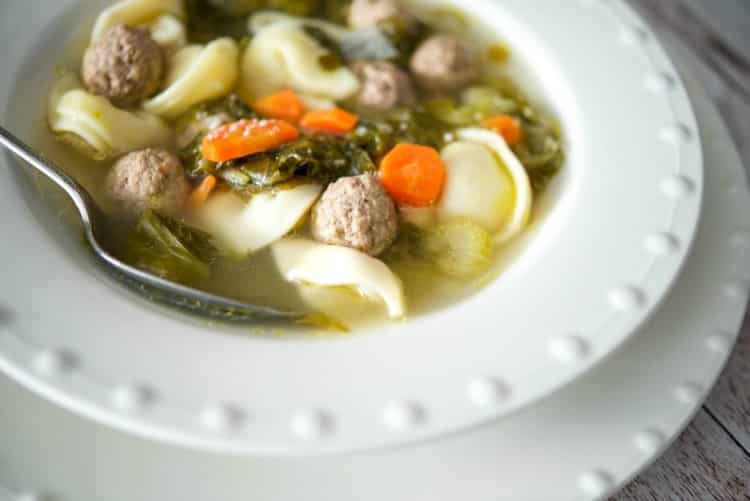 Bring the soup up to a boil again, adjust your seasonings and add pasta or rice until cooked. Easy right? 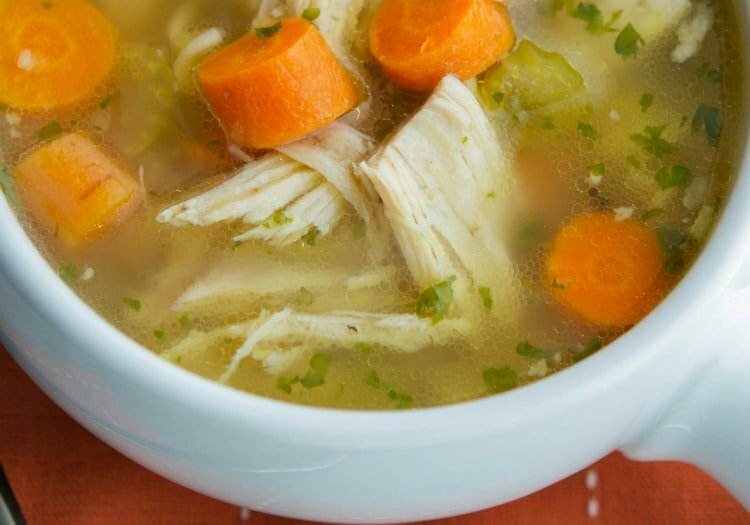 I also make homemade chicken stock this way; however, I don’t add in the extra chicken and I strain the broth through a fine sieve discarding the vegetables before refrigerating or freezing. Besides, it’s much healthier when you make your own broth so you can control the salt. Learn how to make homemade Chicken Noodle Soup using the carcass of a whole roaster chicken. It's simple to make & a staple during those cold winter months. Add the chicken (or turkey) carcass to a large pot; then fill the pot with water covering the carcass. Add your vegetables (I use chopped celery, carrots and onions), salt and pepper and bring to a boil over high heat. Cover the pot, reduce heat and allow to simmer for 1 hour; stirring occasionally. Cut off any remaining pieces of meat from the carcass and add it to the pot, along with any extra meat you may have saved from the initial carving. 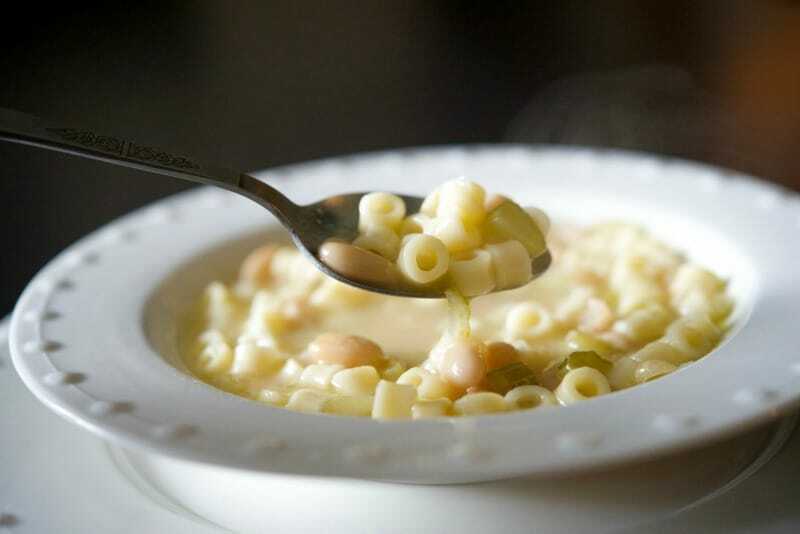 Bring the soup up to a boil again, adjust your seasonings and add pasta or rice until cooked.